Australia won by 111 runs. So there it is, the first day of action done and dusted. We've seen two high-scoring matches and right at the end, a bit of controversy with the Laws. Stephan Shemilt's full report from the MCG. And that's just the start of it all for the next six weeks. Later today, we'll bring you two more games as Pool B begins. First up, South Africa face Zimbabwe in Hamilton and then it's India v Pakistan in Adelaide. Join us from around 21:30 GMT on Saturday. a) If following a Player Review request, an original decision of 'Out' is changed to 'Not Out', then the ball is still deemed to have become dead when the original decision was made (as per Law 23.1(a)(iii)). The batting side, while benefiting from the reversal of the dismissal, will not benefit from any runs that may subsequently have accrued from the delivery had the on-field umpire originally made a 'Not Out' decision, other than any No Balls penalty that could arise under 3.3 (g) above. "England have been preparing for the World Cup for the last few months and then they switch things around in the first World Cup game. Gary Ballance came in, Ravi Bopara went out, James Taylor went from three to six and Stuart Broad took the new ball over Chris Woakes. They wait for the biggest match they've had to make these changes. Surely they had plans in place before today." England captain Eoin Morgan, speaking to Sky Sports: "Throughout the tri-series I felt that Ravi Bopara's bowling would be useful, but that wasn't happening, so it was a straight shootout as a batsman and it was a good opportunity to get Gary Ballance in as part of our best top seven. "The most frustrating part of the day was dropping catches. It's an area we pride ourselves on but we were caught quite cold at the start and made big errors. "We'll have a chat before the New Zealand game. This result doesn't make or break our tour. Our aim is to first reach the quarter-finals but our first two games are the toughest. I'll be looking for our senior players to lead from the front in that one." "It was a splendid, sensible and organised innings from Aaron Finch. I couldn't fault him. Chris Woakes's catch was a straight-forward one at head height. It was regulation. The one from David Warner to Moeen Ali, it would have been a good catch because he hit it like a tracer bullet. England just didn't seem to have the aggression and the intensity." Australia captain George Bailey: "We were very happy to bat first. There was a lot of anticipation, a big build-up, but we felt like we have a strong batting line-up and it was nice to get out there and use that track first. "It's Aaron Finch on his home ground and he rose to the occasion. That's what we're after from our top order. We want great innings and to turn them into match-winning knocks and that's definitely what we got today. "Mitchell Marsh was outstanding, he broke the game open for us. It was a good toss to lose but the same result would have happened if we'd won it." "When England won the toss and decided to put them in, I was thinking that with all the rain in the morning there might have been moisture and movement for the seamers. It did a little bit for four overs - that's not enough for putting people in. Eoin Morgan got it wrong, but it's not all his fault - he will have spoken to other people like James Anderson and Peter Moores. If you get the chance to bat first on a sunny day, you take it." "James Taylor is the form guy at the moment and England should build around him at number three. England have better balance when Ravi Bopara is in the team." "Diplomatically speaking, it was disappointing. But if you want it in straight Yorkshire, it was rubbish. England had a moment when Australia were 70-3. The Aussies had to play with common sense and patience. Aaron Finch played sensible cricket and got his team into a position where he could attack the bowling." England captain Eoin Morgan: "I think the score was probably above par even though the wicket was very good. "Probably 310 was par, but we needed all three guns firing and the top order to come off for us to chase that. "Our fielding was poor and our death bowling not on target at times. We started a bit slow and a bit cold, which is obviously a bit disappointing. "James Taylor was very unlucky at the end not to get 100 and he struck the ball cleanly. New Zealand will be a tough test next up for us and we need to stand up and put in a strong performance." On Twitter: "Message to Jimmy Anderson: maybe England aren't as good as you think they are." Anderson's riposte after Geoffrey had criticised Eoin Morgan. "It doesn't get any better for Aaron Finch. He was dropped on nought and then scored a hundred in his debut World Cup game on his home ground. If he had been caught by Chris Woakes, you never know. But you can't take anything away from Finch. Coming into this game, I didn't rate him against spin but I was wrong. Fair play to him." Man of the match Aaron Finch on his century: "It was nice and a little bit surreal. It hasn't quite sunk it yet, but it's great to get a win first up. "It's nice to get the first game out of the way and get under way here. After being dropped first ball, I just tried to put it out of my mind and play my natural game. "It's great feeling to get this first win out of the way and hopefully we can take that momentum forward for the rest of the tournament." "Thankfully, Taylor is 98 not out and not 98 and out. The letter of the law, as I understand it, is that the ball is only dead after he has reviewed it so James Anderson was right to be run out. Taylor batted beautifully and it was the only silver lining on a pretty grey day for England." "What a way for Australia to start, they have battered England. It was anti-climatic and confusing at the end but it was emphatic from Australia. They got a reasonable start, wobbled a bit but one of their top three got a big score and the momentum swung." Confused by this? I certainly am. What I can tell you is that's the end of the game and Australia have won by 111 runs. After that lbw review against James Taylor was given not out, replays showed Anderson was out of his ground at the non-striker's end from a direct hit and it's he who is the last man out. Taylor is left stranded two short of a century on 98 not out. The leg before is given not out on review, but we could have a run out here. So now we taking a look at that replay against James Anderson at the non-striker's end. Is this it? Has Taylor been denied 100? Full ball from Hazlewood hits him on the pads and Aleem Dar gives him out for leg before. Taylor wants a review immediately. Darryl: If I were a selector I would drop Morgan for Hales, and promote Taylor to number three and make him skipper. He does a pretty good job for Notts. "It's a great little cameo from James Taylor and there's only 10 overs to go, but England have left themselves with too much to do." "You can see @jamestaylor20 growing with every shot... Well maybe not but this is a fantastic innings on the biggest stage." Mitchell Johnson wants to finish this off, but Taylor's still enjoying himself. Picks up a couple as he glances it away to the legside down to long leg. He has to take evasive action from the final delivery as one whistles past his gloves as he ducks away. "Amongst the debris, this is a little gem of a knock by Taylor. Great hands and innovation." Jack Maclaren: The way Taylor has played today just proves to me he should be coming in at three, giving him the time to construct an innings. Shane: Taylor is putting in a great innings in a dire situation and Boycott still plays him down because he's not golden boy Ballance. Tameena Hussain: Watching ENGvsAUS with 1 year old nephew. Giving him a lecture on how he shouldn't play like England when older. He's laughing. More clever stuff from Taylor after that praise from AB as he continues to show his invention. Banged in short by Starc and he helps the ball on its way over Brad Haddin for four more. It's almost all over though a few balls later as George Bailey dives right-hand outstretched to try and clutch a catch at point. Taylor moves in to the 90s next ball with another neat shot with an open face behind the wicket to third man for four more. "James Taylor has been impressive, particularly in the second part of his innings. He's invented some shots and been busy at the crease." The public has spoken and an overwhelming 45% think the Aussies will win the World Cup. New Zealand (14%) and South Africa (9%) were the next most popular picks. England, for those who still care after this performance, collected up only 6% of the vote. "Oh Jimmy, Jimmy. Jimmy, Jimmy, Jimmy, Jimmy Anderson" is the last man in for England. Johnson sends one down in to the body, but it's off target and down the legside for five wides to bring up England's 200. Taylor moves to 80 with another neat use of his hands to open the face and guide it for four behind point. "If you look at the stats, there's not much difference in the scores of the two sides at this stage. It's just England's death bowling was so poor." "Like a beachball, he just knocked it back to Mitchell Johnson. It was the easiest catch of all time... poor Finny was just stuck in the headlights and the ball followed him." Short and in to the ribs from Mitchell Johnson (I think we've been here before). Finn can only fend it off from the shoulder of his bat and it loops up to give the left-armer plenty of time to take the return catch. Very much in to the last knockings here as Steven Finn comes out at 10 for England. Starc sends down some "rippers" as Allan Border would say and Finn gets nowhere near any of them apart from a prod to the legside for a single from the final ball. "He thought it was going to be a bouncer and he just picked the wrong one. It needs somebody to stay with Taylor while he gets his hundred, he's batted really well, has been inventive, has shown a range of shots and I'm very impressed." Thanks for coming Stuart. It's all over after one ball for him today as Starc sends down a Yorker and it hits the base of middle stump. A hint of him backing away there to square leg. Not much else to say about that other than it gives me some crucial fantasy team points. "James Taylor has lovely hands, he's doing well. But you can sometimes be mis-led by stats - can he win the match? Can he see England through in tight situations?" Stuart Broad strides to the middle of the MCG - where a crowd of more than 85,000 have come through the turnstiles today. A fair number of them dish out the now customary boos for him. Meanwhile, James Taylor moves in to the 70s with a clever bit of opening the face against Johnson for four down to third man and then he backs away to get four more down to point. "It was just a slower ball and he didn't pick it. He was too early on his shot, he realised he had been deceived and he just spooned it into the air." That's the end of that for Chris Woakes and Mitchell Johnson claims another England scalp. Woakes tries to loft him over mid-off, but doesn't middle it and finds the hands of Steve Smith, who takes a much more regulation catch this time. Taylor scores six more as this time Mitchell Starc gets tonked down the ground over long-on from a fullish delivery on the off stump. Almost scoring at a run-a-ball here in this knock. Andrew Hook: England cricket showing the tactical skills of Arsene Wenger. Drop the form man, James Taylor, down the order. by 165 runs to Pakistan in Karachi in 2005 - with that six from James Taylor, but they still need a few to ensure this is not their heaviest World Cup loss. That was by 122 runs against South Africa at The Oval in 1999. A fine half century for James Taylor is brought up with a splendid six down the ground off Mitchell Marsh. Buoyed by that shots, he then comes down the pitch and hits Marsh through the legside over mid-on for four more. Good display this from the Nottinghamshire man, trying to put a touch of respectability on things. "This has not been good. It's all about winning and if you are going to lose, make sure you lose fighting. Not like this." James Taylor continues a steady accumulation here, despite his new home at number six. "I'm laughing but it's out of embarrassment. It's not nice when you get annihilated like this." Get those votes coming in and we'll reveal the result shortly right here. Mitchell Marsh - the man whose destroyed England's top order today - is back on to bowl with figures of 5-18 off seven overs. Woakes tries to drive him on the up through the offside, but only finds Steve Smith at extra cover. Another neat and tidy over from Marsh and it's time for a drinks break. Are Australia rightly tipped as favourites? Can South Africa rid themselves of the infamous 'chokers' tag? Will New Zealand finally reach a final? Vote now on who will win the World Cup. Vote using the options the right-hand side of this page, or via the 'vote' tab if you're reading on mobile or tablet. You have a few minutes left before the vote closes at 10:30 GMT. That's enough double spin for Australia as Shane Watson returns for a second over. It's typical Watto stuff, neat and tidy, line and length and just four runs from it. Mick Stratford: I'm confused. England win toss and field, we are not much good at chasing any total and 300-plus... forget it. Morgan's form if he wasn't captain, he would be dropped the selectors need to look at what's happening and show some guts. Guess the England thumped again excuse book is already out. Bowling figures: Starc 5-1-21-1, Hazlewood 6-0-41-0, Johnson 5-0-13-0, Marsh 7-0-18-5, Watson 1-0-5-0, Maxwell 4-0-33-0, Smith 2-0-19-0. Taylor and Woakes bring up a 50 partnership for the seventh wicket and the Nottinghamshire batsman plays a neat reverse sweep off Glenn Maxwell for another boundary. Woakes gets four himself with a conventional sweep and it's pretty easy pickings for these two. Could they? Grant Sheppard: Why play Ballance? Why field first? Fear-based decision making! Phil Gilman: Never mind. At least the next World Cup is in England. Then at least the Aussies can hammer us at a reasonable hour. More spin from Australia as the overs rattle by. Taylor shows some neat footwork against Steve Smith with a four down the pitch, Aaron Finch can't cut it off despite his chase. Nearly within 200 runs of victory now. It's worth remembering that England do need to make a decent fist of this innings in the light of how it will affect their net run rate in the group. On that note, these two have added 39 for this wicket so far, which is very good in the circumstances. Nothing much to trouble them from that Glenn Maxwell over. Steve Smith comes on to bowl and it's a bit of a loose over from the man whose scored truck loads of Test runs this year. Couple of gifts offered up to Woakes and Taylor, the latter cashes-in with a pull shot for four down to deep square leg. "1,000% no. If you bowl it quick, there's no chance you can bowl it. You have to chuck it." For the first time in the game, we've got a review. James Taylor goes again for the pull shot, it passes over his head and through to Brad Haddin. Australia ask the question, but the replays show there's no touch on either bat or glove. Not out. "I think Aaron Finch was too cool for school with that one. He jogged round very casually and barely got his fingers to it." Thank you Marc, at times that last 25 overs has demanded a lot of fast typing amid an England middle order collapse. A sterling effort there. So what do England try and achieve out of the remainder of this game? Well, to start with Aaron Finch puts down a sitter as James Taylor mistimes a pull shot and picks him out at deep square leg. But, Finch somehow doesn't cling on. Lawrence Booth: Luckily for England, the tournament format is so hopeless that this will all be forgotten when they lift the World Cup in seven weeks' time. Like a cat teasing its prey, Australia are tormenting England now. It's almost as if they feel they can decide when to finish this one off. England are milking the ball into the gaps when they can, but there's more chance of Mitchell Johnson shaving his tash off than England chasing this down now. "What positives could you come up with today? Well, I suppose it hasn't rained! Steven Finn has taken a hat-trick even though the first two dismissals were about as far away as you can get from each other in the field. Third man followed by long-off." I bet Australia head coach Darren Lehmann is chuffed to bits with this performance. He'll be cracking open a celebratory, Valentine's tinny in the dressing room. Good, old Boof... he's certainly transformed this Australia team. They are a formidable outfit once again but England are still in there fighting, albeit with the last rites being read. James Taylor top-edges a four off Josh Hazlewood. Savour it. Michael Wallace: It's hard living in Australia and being English. Playing cricket this poorly doesn't make it any easier. Fred Carter: Become England ODI captain = you don't score runs! Andrew Goodfellow: When they suggested Morgan as captain needed to get his ducks in a row, I don't think this is what they had in mind. Should we be getting worried about England's chances of beating Scotland, Afghanistan and Bangladesh? That's the bare minimum they would likely need to reach the quarter-finals. Another Mitchell, the one named Starc, comes into the attack to try and finish off England and there's some brief respite for the visiting fans when Chris Woakes clips a boundary through the leg side. Only brief, mind. "England have had moments today where they've been in the game, Stuart Broad took two quick wickets early on and they also took a couple close together after Aaron Finch's century. But, since then, there's only been one team in it - the team in Australian gold." Earlier today, Steven Finn took the second most expensive five-wicket haul in one-day international history. Compare his 5-71 with Mitchell Marsh's figures: 7-0-18-5. "That's as good as it gets. It's just absolute sheer brilliance. An absolute ripper which was struck as hard as you can strike a cricket ball and Steve Smith has just flung himself to his left and clung on to a spectacular catch." What an incredible catch. Think Jonty Rhodes in terms of its magnificence. Jos Buttler smashes one straight out of the meat of the bat and Steve Smith takes a flying, two-handed catch at short cover. That was travelling and Smith plucked the white ball out of the air as if it was a passing marshmallow. Mitchell Marsh is happy too - that's his five-for. James Taylor and Jos Buttler are being positive in adversity, with the latter reverse-sweeping Glenn Maxwell for four. A few ones and twos make it 11 from the over. "The tone was set for England when that catch went down in the first over as Chris Woakes put Aaron Finch down on nought. It wasn't an absolute dolly, but it was a catch at this level you should take. If you take it, it just gives you that lift and a perfect start." Mitchell Marsh is following in well-trodden footsteps, with his father Geoff being part of Australia's team which won the 1987 World Cup. James Taylor is still in there and fighting for England and he takes a quick single. Jos Buttler also picks up a single but it's heavy going for England. I'll be honest... I had high hopes for England today. It's like the first day of the football season when you dream of success but your team gets walloped 4-0 in their opening game. James Taylor and Jos Buttler face mission impossible now. They take six from Glenn Maxwell's first over. Felix Keith: Sorry everyone. Just got up and started watching - cue batting collapse. Mitchell Marsh though, seriously?! James White: This is all very predictable. England one-day cricket is a total mess. No purpose with the batting and no variation with the bowling. "I think that was a pull shot from Morgan and it came off almost like the end of a snooker cue. It was horribly mistimed. It's another duck for the England captain and his poor run of form continues." It's not getting any better for England. Their skipper, Eoin Morgan, picks up his fourth duck in five innings when he tries to pull Mitchell Marsh but gets an under-edge and Brad Haddin changes direction to taking a stunning, low one-handed catch. Paul Roberts: England's potential quarter-final opponents (should we reach that far) will be employing every means to realise that match up. John Reid: This is what happens when a gym teacher is head coach of a national cricket team and they practice with a rugby ball. Australia still have two slips in place as they search for the last six wickets which will earn them an early night. If they come in the next hour or so, they might be able to take the WAGs out for a Valentine's meal. Or to watch 50 Shades. It's turning into a massacre at the MCG and England seem to lack direction. They are struggling to hit the ball off the square and Mitchell Johnson shows his aggression by throwing down the stumps at the batsman's end. Two from the over. Mark Reynolds: Diabolical piece of captaincy from Morgan! Bat if you win the toss! Joe McCarthy: Why did England play a series, a tri-series and some friendlies and THEN decide to change the line-up? Taylor back to 3 please. Ben Wear: The minnows in this group will be licking their lips after watching this England performance. England are suffocating under the yellow blanket which seems to be enveloping the MCG. Wherever they look, there's a pumped-up Aussie in their face. Mitchell Marsh is a tall all-rounder who is generating decent pace and bounce from his economical run-up. He's already got three wickets and England aren't able to do much more than knock him into the gaps for the time being. Three runs from the over. "James Taylor is sporting a new haircut. How do I know this? "When I went for a trim of my own this morning, the lady who cut my hair informed me that Taylor was in the previous day. "They had to Google him to find out who he is." Just waking up in Blighty? You might want to go back to sleep because it's all going to pot for England. After dropping Aaron Finch for a duck in the first over of the game, the burly opener smashed a ton. Steven Finn took a hat-trick but the Aussies still posted 342-9. Now, in reply, England are 67-4 with Ian Bell, Moeen Ali, Gary Ballance and Joe Root back in the shed. Set your alarm for 10. It might be over by then. "What happens as the batting side now is that the opposition in the field are pumped, they start chasing down everything. As a batsman, you start to think, 'I've got to do something here' and that's when you panic and start to play rash strokes. But, someone has to break the shackles for England." James Taylor, demoted to number six following Gary Ballance's inclusion at number three, is new to the crease and watches from the safety of the non-striker's end as Eoin Morgan bats back Mitchell Marsh's hat-trick delivery. "It was a gentle medium-pace delivery, it wasn't that quick. I don't think it was that short and Joe Root is just trying to help it round and he got a top-edge on it and it went straight up in the air. That really has put the skids under England." It's like groundhog day for England. They are getting pummelled down under by a fella named Mitchell. This time it's Mitchell Marsh, who's on a hat-trick as he induces a top edge from Joe Root and Brad Haddin takes a fine running catch. Shall we just go home now? The MCG is massive, one of the biggest grounds in world cricket. Which makes this dismissal all the more remarkable. Ian Bell swivels on a short ball and clips it high into the leg side where the only fielder for two towns, Mitchell Starc, is handily placed to take a running catch. Patrick Fowler: England bring in an extra batsman and he's out for 10. Classic England. Kev McVeigh: Just think, if things had been different we could have had KP throw his wicket away cheaply instead of Ballance. Richard Brookes: Awful England! Main problem, can't bowl in last 8 overs! And can't score enough in the first 10 overs! Always under pressure. It's 50 shades of singles for England at the moment. With Shane Watson into the attack and the field spread, Australia are content to starve their opponents of boundaries. And it's working for them. "There's nothing special about Marsh and Watson bowling. This is fill-in medium pace and from England's point of view this is the time to at least keep the scorecard ticking. You don't have to go crazy, just keep the runs flowing." England in a bit of a rut here after the loss of that second wicket. They're nowhere near up with the required rate and you wonder how they'll force the issue. The third Mitchell - Mr Marsh on this occasion continues to bowl. A tidy over until Ian Bell cuts away with precision for four runs to keep England ticking over. "Mitchell Starc looks lively fast-medium, but he's a lot more slippy than that. He just needs to harness his talent a bit more and he can be a force in Test cricket, but he needs to keep working hard at it." Mitchell Johnson is beginning to hit fifth gear now and he sends down a rapid bumper which Joe Root jumps out of the way of. Television replays pick up on that last wicket, and notice that George Bailey didn't know where to position Aaron Finch. He plumped for short midwicket and bingo! The very next ball, Gary Ballance picks out Finch. Four more chipped from the target. Happy Valentine's Day in case you've forgotten that date amongst the excitement of all this action. Scotland captain Preston Mommsen has shared how he's spending the big day with his team-mates Iain Wardlaw and Richie Berrington. The Aussies, decked out in yellow, are buzzing around the field like a swarm of bees. England need to be stung into action soon because their run-rate of five an over is well below the 7.32 they need to win this opening match. "It was a lovely bit of fielding trap Australia set for him, but he hit it straight at him. I have to feel for Gary Ballance as he's had very little cricket and he comes in to play in the biggest match outside the quarter-finals and I'm not sure what England are thinking." The Aussies are putting their foot to England's throat here. The runs have dried up and now Gary Ballance clips a catch to Aaron Finch at midwicket. 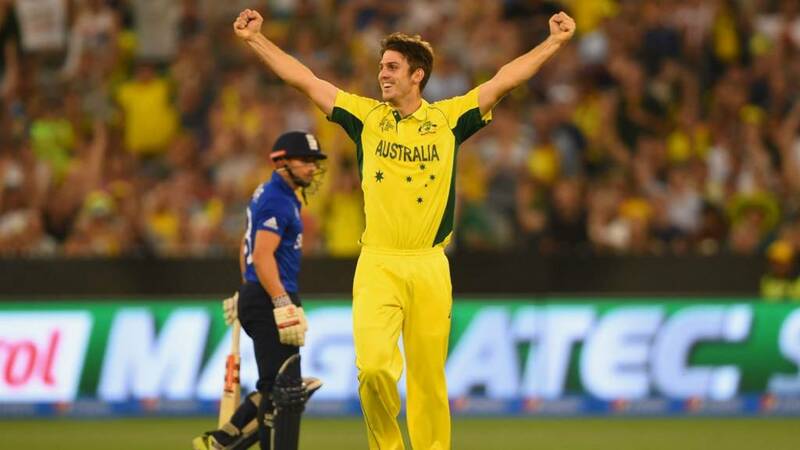 Mitchell Marsh has his first World Cup victim. Ian Bell doesn't seem too fazed by Mitchell Johnson's pace. Like the Teddy Sheringham of the cricket world, his extra class gives him extra time. When the whippy left-armer over-pitches, Bell pounces and carves four over extra cover. He middles another and it looks a certain four until George Bailey makes a fine diving stop. Phil Coulson: England can't get the 1st 15 overs right. NZ smashed 110 in that period and it set them up. England don't seem capable. Tobs: England struggle to get over 280 in one-day cricket ..this will be a walk in the Park for Oz. Deano: Ian Bell is playing a stormer, nice to see a Coventry lad playing at the top level. Josh Hazlewood wipes the sweat from his brow on this muggy Melbourne evening. Ian Bell and Gary Ballance seem content to take their time, knowing there will be plenty of time to chase down this target. Just two from the over and quite a few leaves. "Mitchell Johnson is certainly the most difficult bowler I ever faced in Test cricket. He was a tricky proposition in last year's Ashes. Shoaib Akhtar is still the quickest by a long way. But in terms of left-armers, Johnson is extremely intimidating." An expectant roar emanates from the cavernous MCG stands. It can only mean one thing... Mitchell Johnson is being unleashed on the Poms. With a fresh haircut and a trimmed tash, he slowly goes through the gears against the watchful England batsmen. Two from the over. "It's more of a solid start than anything else. England at just over five-an-over, but they need to go at seven-an-over from this point on because of that fantastic display by Australia earlier to chase down what would be a world record score." England's odds may be lengthening by the minute, but who do you think will win the World Cup? Are Australia now even stronger favourites? How about New Zealand after their win today? Vote using the options the right-hand side of this page, or via the 'vote' tab if you're reading on your mobile. Is there a sudden chill in the air as the sun sets on the MCG? The umpires think so as they call for an extra layer. Ian Bell looks a million dollars out there as he pulls the ball here and flicks the ball there. Gary Ballance weighs in with a boundary through the covers. Fetch that. Paul Day: Wake up, check BBC sport app, see that Finn has taken a hat trick! Then notice Oz have scored nearly 350. Oh well, back to bed. Rob Jones: My prediction is we'll fall 90 runs short, at best. Dan Healy: If England pull this off, I'll live in a monastery & take a vow of silence. No catches, like most of Eng fielding. If you're just joining us, you might not realise that Gary Ballance is playing for England today at the expense of Ravi Bopara, meaning James Taylor drops down to six. Good decision or muddled thinking? Moeen's dismissal brings GB to the crease and the left-hander is off the mark with a streaky four down to fine leg. "Moeen got a couple of drives away in the previous over off Josh Hazlewood. Mitchell Starc a bit more up on his pace and Moeen gets that one too high on the bat and can't get it away." No, Moeen, no. The England opener tries to pull one which is too quick for him and ends up splicing a catch straight to George Bailey at mid-on. "They'll be teams sat in hotel rooms watching this opening game. If England made a poor reply here and don't ever look like getting close to chasing this target, it will show those teams that England are beatable later in this tournament. What they need to do is made a real positive go at this and show their intent." There's a touch of the Glenn McGrath's about Josh Hazlewood - he's tall, upright at the crease and likes to get in close to the wicket at the non-striker's end. Ian Bell greets the young Aussie with a sumptuous cover drive, then the left-handed Moeen Ali cracks successive boundaries through the same area. Just joining us? Good morning. Let me quickly bring you up-to-date. The long and short of it is that England need 343 to beat Australia in their World Cup opener at the MCG. Aaron Finch clubbed a wonderful 135 for the Aussies, after being dropped on nought. Steven Finn took a hat-trick with the final three deliveries of the innings for England. Back to the middle, Ian Bell picks up England's first boundary when he guides Mitchell Starc past the slips for four. England are off the mark! It's with a wide, but they'll take it. Josh Hazlewood shares new-ball duties and delivers a couple of extras but, those blips aside, slips nicely into a nice groove. He's landing it on a sixpence. Five from the over. Australia like to hold the big man - Mitchell Johnson - back so it's Mitchell Starc, another left-arm quick, who takes the new nut. He's quick too, with his first delivery being taken at head height by Brad Haddin. It's fast, full and a maiden over. It's time to see what England are made of. The players emerge through the haze of smoke left by fireworks, with the sun still to set on this glorious Melbourne day. Mitchell Starc to Moeen Ali. Let's play. How good was that knock from Aaron Finch? He helped repair the damage when his side slipped from 57-0 to 70-3 and slowly went through the gears as he took apart the English bowling. Feeling superstitious while listening to England at the World Cup? Going through your own set of routines to try to will Eoin Morgan's men to victory? You're probably not alone. Cricket is a breeding ground for superstitions and this week's "Stumped" on the BBC World Service features interviews with two of the sport's most eccentric characters. Wicketkeeper Jack Russell wore the same floppy sunhat for 23 years, while batman Ed Smith purchased the same two items every morning of his cricket career. The programme also hear from former World Cup winner Jason Gillespie on what it takes to win cricket's biggest tournament, and some tales from legendary raconteur Henry Blofeld. download the podcast right now. "To give you an idea of how the MCG dominates the south-easterly part of this city, I've taken a few photographs to try to illustrate the point. The first was taken a couple of nights ago, after the warm-up match between Australia and the UAE. Even the best part of a mile away, the floodlights shimmer a reflection off the Yarra River." Thanks Adam. I left you at 140-3... what happened?! against Pakistan in 2000. Freddie Flintoff was the hero that day, with 84 off 60 balls. At the MCG, England won the toss and elected to bowl first. Aaron Finch provided the early fireworks for Australia and cashed-in on being dropped on nought to score 135 off 128 balls. Glenn Maxwell then took over the onslaught with 66 off 40 balls. A hat-trick for Steven Finn off the final three balls only managed to mask what was a huge total from Australia of 342-9. Up to speed? I'm off for a lie down in a dark room and Marc Higginson will take you through the resumption. So, caught up with all that late drama? I think my fingers have just about managed to get that late flurry of runs (mainly runs) and wickets down. In case you've not been with us through the night - let us take you through it. 98-run win for the Black Caps. The co-hosts made 331-6 after being put in at Hagley Oval, and Sri Lanka were bowled out for 233 in response. Australia's Glenn Maxwell: "It was nice to get a couple out of the middle and build on a good start. I think 342 is going to be a challenging total. I think the pitch might dry out and crumble a bit and it will be hard to chase." Mark Tomlinson: Super bowling by Finn! Finally something to cheer, just a shame it was the last over! AJ Eriksson: Wow - what a finish to Australia's innings. The hat-trick's the last bit of good news for England though I feel. "At the end of the innings, I was sitting in the stand, surrounded by Aussies. The feeling is that this match is already won and it's hard to disagree. England have never chased more than 253 to win in Australia. Did Australia bat well? Yes. Were they allowed to bat well? Yes. England's fielding was ragged and the yorker an endangered species. Eoin Morgan may also be going to the match referee about the over-rate." "Our bowling at the death was woeful. I'd want to be asking the coach and the bowing coach what the hell is going on, bowling four or five balls out of six short, slow, when it's not working. There needs to be some rethinking and quickly because it might cost England dear. You can't be giving people over 100 runs in seven overs." "It doesn't alter the fact we have to chase 343. Finch was outstanding. He's a hard-hitting player and he whacked Moeen Ali out of the ground but he also picked his shots carefully. It was a top-class innings - Maxwell played well too, and George Bailey should be pleased too." "That is one of the most bizarre hat-tricks in one-day cricket because Australia just went clubbing for the last three balls." It's a hat-trick! One of the most unbelievable and under-celebrated you'll ever see. Mitchell Johnson tries to carve the ball away to the off side, but only finds the hands of James Anderson at mid-off. Steven Finn has a World Cup hat-trick and finishes with 5-71 off 10 overs. "That was an excellent catch. Maxwell hit it quite firmly and Joe Root had to sprint quite hard from mid-off. He had to dive from it, excellent catch." Get one. Get two. Finn bags two wickets in as many balls and it's a cracking catch from Joe Root running round from long-off. "It's a good catch, he did well to get down for that. He's had a tough day and he's bowled a lot of overs." Last knockings of this Australia innings and Brad Haddin looks to cash-in. Running in from third man, Stuart Broad takes a good catch low down. Jimmy Anderson is next England bowler off the rank. More poor stuff here as Haddin tucks in to two short-length deliveries and cracks them away to the off-side boundary. That lesser-spotted yorker finally makes an appearance in the middle of the over before Glenn Maxwell crashes a pull away to the leg side to bring up the fifty partnership off 23 balls. Fenners: Just remind me why Tredwell isn't picked, again? Best bowler. Deano: England can go past 350 on this pitch, don't know what people are worrying about . "It's hard work for England, but the bowlers haven't helped. The last seven or eight overs have been a problem for England for a while. Some of the numbers are mind-blowing." Stuart Broad comes on to bowl his final over to a chorus of boos from the MCG crowd. Haddin shows a class touch opening the face and guiding the ball for four past third man. That man then comes up in to the circle and Broad decides he wants to bowl the slower ball bouncer. More class from Haddin as he just lifts the ball over the infield for four more. This partnership has reached 40 already. Wisden editor Lawrence Booth: Yorkers may be tough to bowl, but why do England never even seem to try? "Woakes is bowling that slower ball almost every ball it seems. The batsmen know what's coming - we do and we're up in the commentary box." Among all that action from Maxwell, I haven't had time to mention that it's Brad Haddin in with him now. He gets going with a pull shot for four from yet another Chris Woakes slower ball bouncer. Anyone hear a broken record? Ed Palmer: This will be a huge score. We consistently underestimate what the good sides can reach. Over 300? 350 at least. "How are you with heights? This is the view from the very top of the MCG. Climbing it is a feat itself. England's chase is starting to look like a much tougher ascent." More runs come flowing from Maxwell as he tickles one down to fine leg for four more at the end of that destructive over. Australia almost past 300 now with four overs to go. "Glenn Maxwell can play. If he can harness his concentration, he could maybe make the Test side. He has a wide range of shots." Maxwell dispatches Steven Finn away to the leg side for four and The Big Show reaches 50 in quickfire time. It's a tough one, but it'll go down as a drop as Maxwell takes a big swing and edges through to Jos Buttler. He puts one hand up to reach it, but can only tip it over the bar goalkeeper-style and away it goes for four. "When the blood's rushing, we've all done it: first ball, new bowler, have a dart. If he had just taken a little time, a few more balls..."
Mitchell Marsh looks to dispatch Steven Finn over the ropes, but doesn't get the full meat of the bat on a tempting short of a length ball. It loops up to long-off and Joe Root has plenty of time to set himself and take an easy catch. Whatever happened to the art of bowling a good yorker? Pardon my whining, but Chris Woakes serves up two pretty dreadful deliveries at the start of the over which Mitchell Marsh dispatches for four with ease as the lack of pace and length give him plenty of time to choose his shot. Maxwell doesn't want to miss out on this buffet and helps himself to four off the final ball as he glances it down to fine leg. Pete Bancroft: I often wonder what England's ODI analyst does all day? Still no plan for Finch despite knowing exactly how he plays. "I'd have batted Glenn Maxwell above George Bailey, he's a better batsmen. He's got a better eye and you need to give your best batsmen as much time as possible. In terms of Michael Clarke, he cannot return until he is fully fit. If he breaks down, the selectors might start thinking they can't take him to England for the Ashes." Jimmy Anderson is on to bowl again for his ninth over. He too pulls the slower ball bouncer out of his bag of variations. Maxwell and Marsh tick a few singles over before Maxwell backs away and slashes Anderson away for four through the covers. "I don't think England can stop Australia getting 300. It's how many they get on top of that which will make it difficult for England batting second. This is England's most difficult area, when they bowl at the death. We could and should be a bit better." Runs are flowing again here for Australia as Graeme Swann beats a hasty retreat from the commentary box. Marsh drives Chris Woakes confidently down the ground for four. Woakes sends down a couple slower ball bouncers in response and catches Maxwell out on the first occasion as he plays too early at a pull shot and misses. Already this partnership is worth 30 and looking ominous for England. "I apologise to all England fans... it's my fault. As soon as I say England have clawed it back Glenn Maxwell plays two great shots." Stuart Broad comes back on for his third spell. Maxwell drives uppishly in to the offside and Morgan is across well to stop it from being more than one run. He shows his power though with a neat shimmy down the pitch and a couple of lusty blows down the pitch over mid-on for four. The Big Show showing his intent here. "You just sense that in the last few balls, the momentum has shifted in England's favour slightly." Finn continuing after he claimed the scalp of Bailey in his previous over. As Graeme Swann says, it's all set up for a late onslaught. Tidy stuff from Finn as just four runs come from that over. "Teams nowadays want to score 80-100 runs in the final 10 overs so that would put Australia around 320. But you can chase 300 here. I've played in a game where we scored 300 and Shane Watson came out and smashed about 180." Moeen gets through his ninth over. The crowd at the MCG appears to have hushed after those two quick wickets, it's probably only temporary though. Marsh and Maxwell pick up seven from the over with little alarm. "It was a very strong start for New Zealand today. From ball one, Brendon McCullum came out and smashed it. They really mean business and they are my favourites to win the tournament." A very good morning if you've just woken up and are joining us for the first time. Aaron Finch has led the way for Australia with 135 off 128 balls. The new man in at number seven is one of Australia's three Mitchells - of the Marsh variety in this case. Steady stuff from Finn as England look to keep this tight. "George Bailey has done a great job. How can Australia drop him after that knock? Even if Michael Clarke is fit to return. Steven Finn looked fired up after taking that wicket and England have two new batsmen at the crease." Nick Bruzon: Is it too early to say this is looking like a St. Valentine's Day massacre if the Aussies carry on scoring at this rate? George Bailey chops on to his stumps as he tries to cut Steven Finn away. Bonus time for England and now they have two new men in. "I like people who play shots like the reverse sweep early on. They get stick off some people, but good on them!" Maxwell's off and running with a reverse sweep four from his third ball. Taking a shine to Moeen's bowling and looking like a man who wants to get Australia to a huge total. Simon Witt: Too little too late. Didn't keep the pressure on as usual when we took wickets. We haven't even had our batting collapse yet. Glenn Maxwell's the new man in after Finch's departure. England missed a chance for a run out earlier in that over as Bailey and Finch got in a tangle. But so did Steven Finn. He'd set himself at the non-striker's end to take the ball and then it appeared to suddenly bounce up high on him, knocking off his feet. Bailey got through for three, which brought up his 50 off 63 balls.